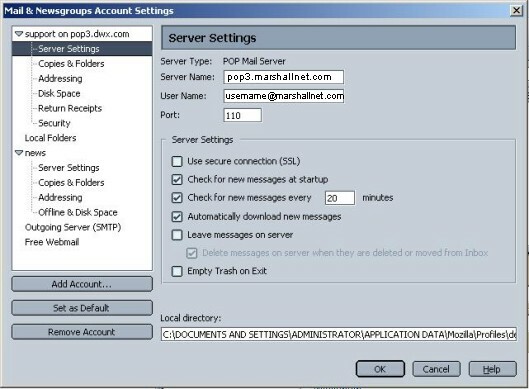 First open up Netscape and go to your mail. Then click "Edit" and choose "Mail & Newsgroups Account Settings". Make sure the top arrow faces down like below, and highlight "Server Settings". Match your screen to the window below, making sure the "User Name" is your entire e-mail address, including @marshallnet.com. 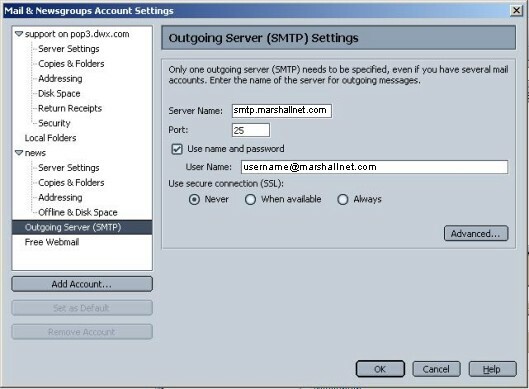 Next click on "Outgoing Server (SMTP), and match your screen with the one below. Make sure there is a checkmark next to "Use name and password", and that your "User Name" is your e-mail address. When finished click on "OK" and you are ready to send and receive mail on our new server.